electronic proof of delivery while improving driver safety. of end-to-end delivery with confirmation of delivery and tracking. timely delivery of packages, internally. to document chain of custody and help ascertain the pedigree of materials. loyalty and compete in the marketplace. ShipTrack is an innovative last mile delivery logistics platform designed to provide complete control and visibility of any shipment’s movement worldwide. ShipTrack enables shippers all over the world to provide customers with greater convenience, complete visibility, and control of their deliveries. ShipTrack is a simple, easy-to-use delivery logistics software platform with numerous applications across a number of industries and specific use cases. It has the potential to not only benefit carriers and the consignees they deliver to, but anyone who requires chain of custody and item-level tracking. ShipTrack has the potential to benefit companies of all sizes by increasing delivery speed and reliability. It can improve customer service and streamline operations. With same day set-up and zero start-up costs, servers or contracts, you can be ShipTrack enabled in no time! ShipTrack’s easy-to-use interface allows vendors to provide highly accurate and controlled shipment tracking to their customers. The user-friendly administration panel allows for management of multiple drivers, deployment of a fully branded web portal and the collection of valuable business metrics. Drivers can use the intuitive mobile app to provide status updates, take pictures of shipments, and automatically report location. SIGN UP FOR A FREE DEMO & START TRACKING YOUR PACKAGES TODAY! The digital age has placed information on just about anything at the fingertips of individuals and corporations alike. As a result, customers expect last mile delivery directly to their homes and businesses. Customers across all industries are demanding the added convenience of being able to track their shipments globally. ShipTrack is a revolutionary track and trace solution designed to provide end-to-end visibility of any shipment’s movement globally. This is the case regardless of who, or how many hands it passes through along the way. 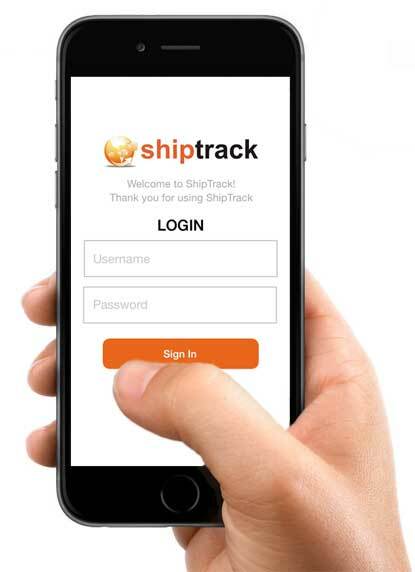 The ShipTrack app delivery platform is a global package trace tracker. It enables vendors all over the world to provide their customers with greater convenience, complete visibility, and control of their deliveries. ShipTrack is an innovative delivery logistics software platform with an endless number of benefits for companies of all sizes. The system has been designed to make it easier than ever before to provide customers with the tracking information they need, and the advantages of improved customer service and streamlined operations will become immediately apparent. We’ll let the numbers speak for themselves. Large international professional overnite courier companies have raised the bar and created a new minimum standard in the transportation industry by investing a great deal of money and effort in package trackers to provide their customers with immediate information about shipments. Most other carriers don’t have the budgets or infrastructure to support a complex online information system that includes the features consumers are demanding … until now. ShipTrack is a simple, easy-to-understand service that is providing highly accurate and controlled package trackers to the masses. Whether you are a bike courier, professional courier, or transportation company, the ShipTrack mobile app enables your company to increase delivery speed and reliability, improve customer service and retention plus streamline your operations. With the ShipTrack track and trace system, your drivers can provide status updates, take pictures of shipments, and automatically report location. The easy to use administration panel also allows for easy management of multiple drivers, deployment of a fully branded web portal and the collection of valuable business metrics. Even international mail tracking is fully integrated. The system as a whole has the potential to speed up invoicing and eliminate paper once and for all. You’ll receive all of the power and functionality of ShipTrack for one small fee per shipment, which means you only pay for what you use! The track and trace cloud service includes a free driver app for Apple, Android and Windows smartphones along with a fully branded web portal. No matter where you are, or what you’re looking to track and trace, ShipTrack is the way to go.